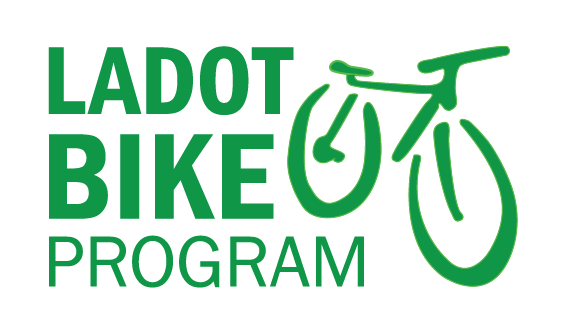 LADOT Bike Blog is back for more “Biking for Newbies”. Again, if there’s anything you guys would like us to cover with this feature in throughout Bike to Work Week, just let us know in comments and we’ll try to tack it on. Speaking of Bike to Work Week, make sure you check out all the cool things that are happening. You can check out Metro’s website, look at what we’ve provided for you, or get a recap on Monday’s event. In LA? Yes. Most any place else? No. Most cities make sidewalk riding illegal, but LA is an exception. The LA Municipal Code only prohibits sidewalk riding when it is done with “with a willful or wanton disregard for the safety of persons or property“. This is admittedly vague, but it essentially means: ride at a walking pace and be mindful when navigating around pedestrians or businesses whose doors open directly onto the sidewalk. If you want to know about sidewalk riding rules in the rest of LA County, look no farther. A lot of new bicyclists tend to ride on the sidewalk because they think it’s safer than riding in the roadway; It can certainly seem that way when watching the cars zoom by on a thoroughfare like Wilshire Blvd. or Washington Blvd. What sidewalk riders often don’t realize, however, is that cars are looking for cyclists on the road and not on the sidewalk. Riding your bike on the sidewalk puts you in danger of collisions with cars turning corners, coming in and out of parking lots, driveways, and alleyways. It also creates a high risk of collision with pedestrians. We recommend all cyclists stay on the roads. It is the safest place to be as a bicyclist, even though it may not seem that way at times. Do I need a license to ride my bike? Nope. Uh-uh. Nyet. Nein. The old ordinance requiring a bicycle license was repealed on June 2nd, 2009. It didn’t serve much of a purpose and was almost never enforced. Even though a license isn’t required, it’s a good idea to carry some form of ID and emergency contact information with you every time you go out on your bike. More “Biking for Newbies” soon! What about Santa Monica? I know that city isn’t the focus of this blog, but I think we have all made our way to the Marvin Braude Bike trail and are familiar with biking in that city’s limits. Doesn’t the City of Santa Monica prohibit riding on the sidewalk and ALSO require a registration for all riders in teh city limits? What’s your source for “Most any place else? no” and “Most cities make sidewalk riding illegal”? I haven’t studied this, so I could be mistaken, but it’s my impression that relatively few cities throughout the state have actually enacted laws prohibiting sidewalk riding. In ~88 cities in L.A. County, I think anti-sidewalk-riding laws may be only applicable in Glendale and maybe Pasadena – and I think it’s only applicable to the more theoretically-pedestrian-oriented business district areas in those cities, not the entire city. I don’t recommend sidewalk riding (except sometimes for short distances to get from midblock to corner) but my understanding is that it is more commonly legal than illegal. As you appositely described, sidewalk bicycling can be dangerous, and discourteous… but still generally legal. I think that you’re incorrect when you state that biking on the sidewalk is legal “as long as you’re riding with traffic.” Sidewalk foot traffic goes in both directions – there’s no sidewalk riding direction to be “with” or against. There’s no L.A. law stating that riding on a sidewalk would need to be in the direction of adjacent car traffic, either. It may be marginally safer to ride in the direction of adjacent auto traffic, but even that’s questionable. Cars exiting driveways hit sidewalk cyclists going either direction. As you mention those drivers tend to look to the street in the direction of oncoming traffic, and may overlook faster-than-walking-speed sidewalk bicyclists – coming from either direction. To my knowledge, the direction one bikes on a sidewalk or a crosswalk is not part of the law in L.A. or anywhere else. These facilities have no legal directionality. Please clarify what legal implications you’re stating are relevant to which direction one rides on a sidewalk. Regarding what features I’d like to see you cover, how about more explanation on the “We’re working on 14 Bike Lane projects in various stages of design and installation” statement you made on March 24th 2010. What 14 projects are these? Please share the list that you’re alluding to. When are they anticipated to be designed and installed? All good questions. In regards to where sidewalk riding is legal, I used general language because I was speaking in broad terms. Most major cities (like San Francisco, Chicago, New York, etc.) don’t allow sidewalk riding. Biking in LA also has a great post up on Glendale’s law against sidewalk riding (and it’s vagueness). Lawndale(Code 10.10.090) also prohibits sidewalk riding. Torrance)(Section 62.1.4) has a sidewalk riding law similar to Glendale. Santa Monica(3.12.540) doesn’t allow it either. Putting together a list of sidewalk laws for the various cities around LA is a great idea. Once the dust settles from Bike to Work Week, we’ll dedicate a whole post to the subject. Regarding the 14 bike lane projects, the subject isn’t exactly germane to the “Biking for Newbies” series, but it definitely deserves its own post. Again, something we’ll put on the docket for post-Bike to Work Week. Regarding: “Most cities make sidewalk riding illegal” – Six examples out of 88 cities in L.A. County still does not constitute “most.” Nince cities around the world do not constitute “most.” In most cities locally and on planet Earth, sidewalk riding is legal. It appears to me that you’ve published your erroneous conclusion before you did the research. Regarding what’s germane for newbies: I think it’s germane because those facilities are where newbies want to ride. Oldbies like me ride anywhere. Regarding “As long as you’re riding with traffic, you can legally ride your bike on the sidewalk.”: your post remains incorrect, and your comment didn’t address this at all. Why are you giving legal advice that has basis in law? Why are you stating that sidewalk traffic has directionality that’s based in law? Thanks for this post (and blog in general) – really helpful! I agree we should encourage “newbies” to get started biking, including on the sidewalk at first if that’s what it takes for them to feel safe (especially given there is inadequate cycling infrastructure and education). In the long run, I also see the post author’s point that street cycling is often safer, allows cyclists to go faster, and is legal state-wide, while sidewalk cycling can lead to tickets in certain parts of the county. Pedestrians are our comrades in the movement for alternative transportation and also deserve safe passage, and transitioning to street cycling also promotes good relations between cyclists and pedestrians. I salute the numerous efforts throughout the county by LACBC and so many others to make street cycling easier and safer for cyclists by promoting infrastructure and education!